On Tuesday we posted on The Tattler a few questionable pictures that were found on Bob Harbicht's Arcadia City Council campaign Facebook page. They were part of a media outreach campaign designed to help publicize his recently received Arcadia Police Officers Association endorsement. Unfortunately for Bob, he screwed it all up, apparently breaking a few laws in the process. Word about our post got around town quickly, and soon Arcadia City Clerk Lisa Mussenden was forced to get in touch with a very naughty Bulldozer Bob and tell him that you can't do things like that. No word if Bob was also given a time out by the City Clerk for being so bad a boy. Here is that original Facebook photo, complete with the potential campaign law violations that so entirely unnerved Ms. Lisa Mussenden. Below is the same picture, but it has been airbrushed by the Harbicht campaign to comply with the legally driven demands of City Clerk Mussenden. Two things have been removed from this second version of Bob's Facebook photo. In this amended photo the police badge attached to Detective Ken Lee's belt (second dude from the left) has been airbrushed away. That corrected an alleged violation of both California campaign law and the Federal Hatch Act. Police Officers cannot appear in political campaign photos or advertising wearing any items such as that. 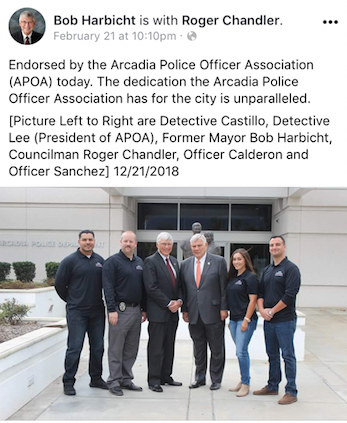 Additionally the words "Arcadia Police Department" have magically vanished from the left hand side of the building these folks are posing before. 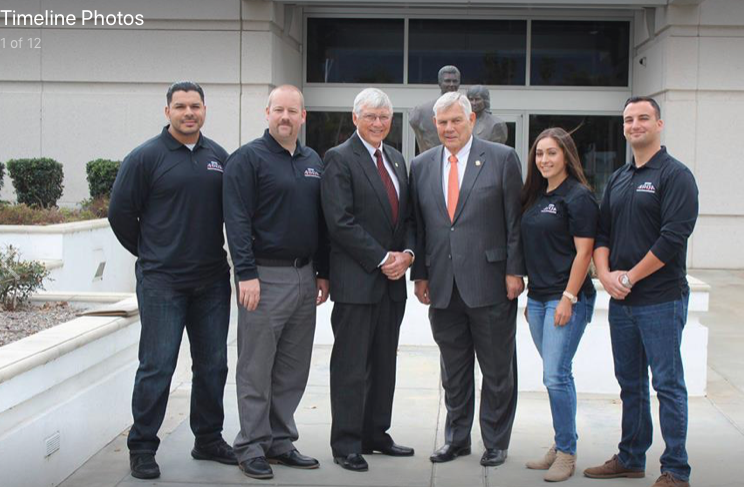 Again, using a Police Department building such as this particular one in a political campaign photo op that includes the endorsing police officers and at least one cop badge would also be a violation of applicable California and Federal political campaign laws. This next screen shot is how the original, and potentially illegal, Facebook presentation appeared. Complete with that endorsement plug, plus the police titles and names that accompanied it. Note that each of the Arcadia PD members are identified here by their official city government titles, such as "Detective" or "Officer." Below is roughly the same picture and verbiage, but this time with a notable difference. In addition to the airbrushing we just discussed, you will also see that the titles of the officers in this Facebook post have vanished. Correcting even more alleged campaign law violations that City Clerk Lisa Mussenden had to call Bulldozer Bob out on. 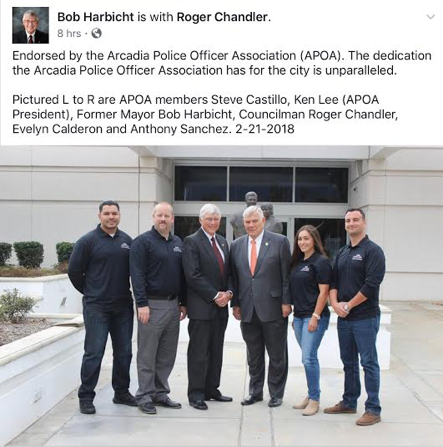 Please remember, the Arcadia Police Officers Association didn't endorse Bob Harbicht or Roger Chandler because they're tough on crime, or look nice wearing their ties. No, the APOA endorsed them because they had been overly generous with cop salaries and pensions in the past. So much so that it has resulted in Arcadia now carrying over $130 million dollars in unfunded pension liabilities. Something that will certainly increase should Harbicht and Chandler be returned to the City Council. Do you really want to vote someone like Bob Harbicht into a position that comes with the extremely complex responsibilities necessary for running a city? Especially when Bulldozer apparently cannot even properly administer a political campaign Facebook page without getting calls from the City Clerk? Or people filing FPPC complaints? One more thing. While the FPPC in Sacramento has already been adequately notified by concerned residents, Arcadia's City Attorney Stephen Deitsch would probably benefit by hearing from you on this matter. His email address is Stephen.deitsch@bbklaw.com. Drop him a line and let him know you care. And tell him The Tattler sent you. and they care enough to investigate. City attorney won’t do squat. Harbicht made changes to all of the things point out by The Tattler on Tuesday. Somebody put the fear of God in the guy. The city atty does enjoy getting mail. He likes to stay in touch with the community. How is his Gem Coin investigation going? The city attorney has concluded that they are not backed by amber mines. Don’t forget to come to the Candidates Forum next Wednesday at Arcadia Library. But, unfortunately, you won’t be able to ask him about his latest BS, since event is put on by Arcadia Assoiation of Relators who FILTERS your written questions. I wonder who does Bulldozer Bob's airbrushing for him. Seems very professionally done. I wont be sending out anything to Arcadia's City Attorney Stephen Deitsch. I don't need any trouble when in Arcadia. NO SIR RE, not me. What exactly has the APOA done for the city of Arcadia? I know what the police department does, but what does the APOA do? Sucked up a ton of money while doing nothing about crime. The peafowl of Arcadia wish to endorse Tom Beck. The peafowl’s dedication to the city of Arcadia is unparalleled. They actually live in Arcadia, unlike the members of the APOA. What I admire about the peafowl of Arcadia is that their #1 priority is not feathering their own nests. Peacock's are the perfect Beck supporter.. they have bird brains just like two faced Tommy! 8:17 - Your witless post points that finger back at you. Wow 8:17, you sure know how to put someone in their place! You should really try a little harder or maybe just eat your cream of weat, give yourself a diaper change and take a nap. You are trying to engage in a battle of wits and are clearly unarmed! Ask your friend Tom Beck to give you better ammo for this exchange. If there is no crime you will need less police. When has a crooked politician ever changed it's spots of criminal activity or connections? These of course are what quality's him to be in the dirty business that is sheltered by white collar crimes & criminals. Dirt in & dirt outdid you expect anything else? According to Harbicht and Chandler Arcadia is awash in a sea of crime. So whose endorsement did they seek out? The very people who were supposed to stop all of that crime. Is there a live brain cell between the two of them? 7:59 talks about crime without the first hand experience of the the total problems cities are exposed to. I am sure you have a long list of excuses. What has Tom Beck done to help fight the crime Arcadia? Oh that's right, he invented the Ring Doorbell...or was that exposed as the lie it is? Take a look at crime statistics in Arcadia and you'll see that APD is taking more burglars and thieves to jail than ever before. Stay informed with the truth folks, not what Tom Beck wants you to believe. Airbrush Harbicht is the one blabbing about a crime wave, knucklehead. Try and keep your lies straight. Harbicht has his own Facebook crime wave going on. According to Transparent CA, Arcadia PD Chief Guthrie makes a ton of money. If crime is so bad, why is this guy being rewarded so handsomely? All cops nowadays are overpaid and overcompensated. Also, ridiculous pensions are at exorbitant cost of taxpayers. We can thank politicians bending to the whims of the corrupt police unions. Wait. Arcadia has a City Clerk? You are wrong and by accusing Harbicht of a crime you can be sued for libel. Under the law, the person violating the law is the cop. The cop has a duty not to appear in uniform. Harbecht has no such duties. This is not an FPPC violation on the part of Harbect which you will discover when you call the FPPC and they tell you to call the DA office and report the cop. Harbicht posted the material on a political site that he controls. Try and keep up, Einstein. Does not matter. Harbicht has no liability under the law. The law restricts the officer's conduct, not Harbicht. Typical tattler...pretending to be an expert on something you actually know nothing about. That limits the conduct of the officer...not Harbicht. Einstein. So Harbicht put all that stuff up to nail Detective Lee? Nice friend. The FPPC can't even limit a candidate wearing a uniform much less posting a picture of someone else wearing a uniform. Lee is head of the union. He flashed his badge intentionally. He should be reported to the DA. In addition, if Chandler is considered an "employee" of the city of Arcadia (he gets paid to attend council meeting and might get a W-2) then he may have violated the law prohibiting agency employees from soliciting money from other agency employees. Actually Harbicht screwed all those officers by posting that material on a political site. They might want to rethink that endorsement. Bob only cares about Bob. Blue'd and screwed. It is dangerous for commoners to get too close to royalty. Oh, to be a fly on the wall at the Police station. It is not a criminal violation at all. It's a civil matter under the Government Code; citizens can sue for injunctive relief to stop the distribution of any violating materials. (See California Common Cause v. Duffy, 200 Cal. App. 3d 730). And the comment about being sued for libel is dead wrong. This is a public figure running for office. If that was libel, we'd have an awful lot of "lock her up" folks wearing orange suits these days. Didn’t Harebedian do the same thing? Yes. City Hall kept and clamp on that one. Johnny is far too special for any kinds of incrimination. So, anyone know who the new Sierra Madre City Clerk is? 9:53am that's a laugh, Bob Spears wife as Sierra Madres City Clerk. Why are you laughing? She seems like a smart and able person. Did she ever attend barbecues at Bart Doyle's house? I thought that was a requirement. If she is anything like Bob, the City will be in good hands. The Dirt's appear to be dusting themselves off. Yes. There is a lot of development money out there for this election. Some of it from other countries. The revelers will dance around the fake holiday tree in Kersting Court. Probably all the Starbucks they've been drinking. Harbicht is making a laughingstock of Arcadia. It's nice that we have commenters to clear up exactly what laws were violated, who violated them and where to report them. This blog is true to the spirit of freedom of the press. Arcadia Weekly gives a lot of space to The Tattler this week. If you do not want mansionization and Mater Dolorosa development then you better start pressing for Harabedian and Capoccia to run for 3rd terms. Goss and Arizmendi will be easily reelected but Delmar is basically not campaigning and may lose to Jose Andres Bencosme and if Harabedian and capoccia leave in 2 years and are replaced with "property rights" candidates like Chandler and Harbicht then along with Jose they will have majority control and Goss and Arizmendi will be overruled. You will see Sierra Madre become Arcadia pretty darn quick. Delmar needs serious help. She only won 4 years ago because Noah Green ran an even worse campaign than she did. Noah lost because of his pictures. Noah lost because he didn't send out mail. The naked hammock picture meant nothing. It was just a guy having fun on vacation. True. When half the town was calling him "Naked Noah" they were talking about his preferences in fruit juices. Andy is running a wonderful campaign. Too bad it is taking place in Arcadia. Not gonna happen. Harabedian and Capoccia will be termed out. Oh I don't know, I feel that Ms. Delmar will be just fine. She brings ideas to the council and after some rattling around the boys finally come to their senses. Ms. Arizmendi is just a place holder on the political horizon. Denise is a great council member. The concern is that not enough low-information voters know it and she may not do enough campaigning to get the word out. Andy seems a joke, but he clearly has plenty of realtor money behind him. Andy is just a cut out for the same development interests that caused so much harm to Arcadia. No one on the council knows the General Plan as well as Delmar does, and she is committed to implementing it. She held that update together through 4+ years, and an obstructionist city manager. Lose. It doesn’t matter how great you think she is. If a realtor carpetbagger from Arcadia wins, the whole town will lose. Pay no attention to 8:10. S/he is just an Andy supporter, who's trying to sneak some negative information about Delmar into the discussion. If you do not want mansionization and water sucking houses at Mater Dolorosa, vote for all three incumbents. Then we won't have to worry about two more realtors on the City Council in two years. Only if Andy gets voted in this time will we have to worry. Spread the word, put up signs to show your support for the incumbents. It costs about $10,000 to run a campaign, even in our little town. Andy's got the money from the Arcadia Board of Realtors, the other three haven't been bought. 2:41pm. You do not take into consideration all the supporters of Mater Dolorosa. These supporters all acknowledge that the property rights of the Mater Dolorosa were violated from the down zoning presented by these same council members running for re-election. 5:212 - you do not take into account the rights of all the homeowners who live in the vicinity of the monastery. Those who would have to endure years of construction, dust, diesel fumes and heavy truck traffic so some developer can make millions off of their misery. Your hatred of your neighbors is well-documented. Do elaborate, 5:21. What downzoning? There has been no downzoning. Probability of hope hicks and dump had some hanky panky going not zero. Interesting, the picture was taken on 12/21/17. But Jan 23, 2018 Detective Lee gave 2 of city council candidates interview for police association endorsement. How funny is that. No wonder, They don't earn the trust from people of Arcadia. They can only support people give them high salary and sitting around to wait for the juice pension to come. You have to wonder what Harbicht promised them for that endorsement.